CONCORD, CA--(Marketwired - March 30, 2016) - Game Ready®, the leader in active compression and cold therapy technology for injury treatment and post-operative recovery, today announced it is publishing a resource detailing recovery strategies for patients after shoulder surgery. 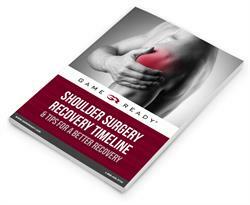 The guide, Shoulder Surgery Recovery Timeline + Tips for a Better Recovery, is available for free download at info.gameready.com/download-shoulder-surgery-timeline-tips-for-a-better-recovery. "Recovering from shoulder surgery is a process that takes time," says Craig Grabell, President and CEO of Game Ready. "However, the timeline can be accelerated by avoiding complications, appreciating the physical limitations during each phase of the recovery process, and following certain steps in order to promote faster healing. Our new guide details these considerations so that patients can return to regular activity as soon as possible." For additional information about this new guide or Game Ready's products, visit the company's website at www.gameready.com. Game Ready® (CoolSystems, Inc.) is a best-in-class sports medicine and orthopedic medical device that helps athletes and patients speed recovery from injury or orthopedic surgery. The system uses ACCEL® technology to set a new standard in recovery, synergistically combining active compression and cold therapies in a revolutionary treatment system that gives healthcare providers the power to accelerate the body's natural repair mechanisms. Game Ready is so effective that it can be found in the training rooms of virtually every professional sports team in the United States, as well as the most elite orthopedic and physical therapy clinics around the world. For more information, visit www.gameready.com.